DNA is synonymous with life, but where did it originate? One way to answer this question is to try to recreate the conditions that formed DNA's molecular precursors. These precursors are carbon ring structures with embedded nitrogen atoms, key components of nucleobases, which themselves are building blocks of the double helix. Now, researchers from the U.S. Department of Energy's Lawrence Berkeley National Lab (Berkeley Lab) and the University of Hawaii at Manoa have shown for the first time that cosmic hot spots, such as those near stars, could be excellent environments for the creation of these nitrogen-containing molecular rings. 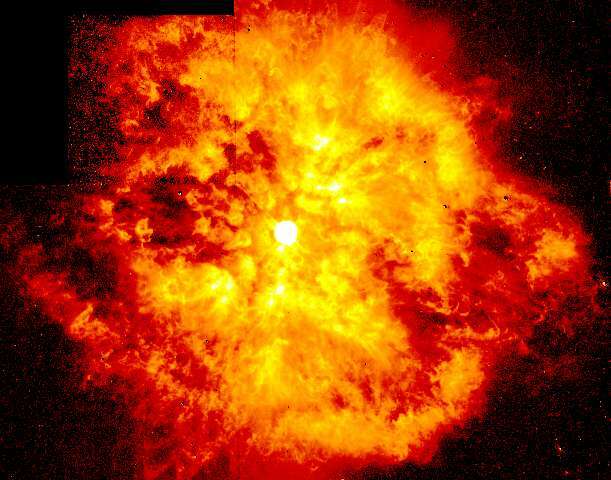 "This is the first time anyone's looked at a hot reaction like this," says Musahid Ahmed, scientist in the Chemical Sciences Division at Berkeley Lab. It's not easy for carbon atoms to form rings that contain nitrogen, he says. But this new work demonstrates the possibility of a hot gas phase reaction, what Ahmed calls the "cosmic barbeque." For decades, astronomers have pointed their telescopes into space to look for signatures of these nitrogen-containing double carbon rings called quinoline, Ahmed explains. They've focused mostly on the space between stars called the interstellar medium. While the stellar environment has been deemed a likely candidate for the formation of carbon ring structures, no one had spent much time looking there for nitrogen-containing carbon rings. "There's an energy barrier for this reaction to take place, and you can exceed that barrier near a star or in our experimental setup," Ahmed says. "This suggests that we can start looking for these molecules around stars now." "Once ejected in space, in cold molecular clouds, these molecules can then condense on cold interstellar nanoparticles, where they can be processed and functionalized." Kaiser adds. "These processes might lead to more complex, biorelevant molecules such as nucleobases of crucial importance to DNA and RNA formation." The question is from were originate the information encoded in DNA? DNA molecule is only the carrier of information needed for life. The answer is not difficult. From God. Perhaps. But it is certainly not from YOUR god, the god who wrote books about things that we know never happened and people we know never existed. Your god either didn't know the past, knew it and chose to ignore it, or, with his infinite power stick chose to obliterate the past he described in his books and replace it with totally convincing contrary evidence. Evidence which tells us that other things were going on back then which would have made his fables and fairy tales impossible. And so we can conclude with confidence that book gods who require strict diets and styles of dress, and the subjugation of women, and the mutilation of genitalia, and the stoning of insolent children, and the annihilation of all who prefer evidence over the kind of faith specific to their respective credos, never existed to create the universe which we are becoming more familiar with day by day. And the more we learn, the more obvious this absurdity becomes. From what God? From unknown God that created us and loose interest to us? From another God who do not gave to us ten commandments which are very uncomfortable for many people. I understand that you believe in one comfortable god that you want to invent his image to fit your pasions. And who will not judge you for your deeds and not require from you a change in positive direction? That you lack historical knowledge does not make you claims credible. 1. Why does your claimed god (Old T) only communicates arbitrarily like lazy uneducated humans ? 2. Why does your claimed god's actions appear so much like a nasty devil ? viko_mx, have you considered EVER that whoever compiled old testament did so because they had a collection of dreams they tried to make sense of (Eg David), possibly from a sincere desire to explain why ALL life suffers the same regardless of location, wealth? 4. Why is it that as we observe nature & life is Part of Nature's "Eat AND be Eaten" all the time always at all levels, it is in contradiction to such a creation from a "loving" god ? 5. Where is the education from your god, ANY god to alleviate suffering ? 6. Your god punishes to make suffering, so according to your logic isnt it correct to conclude that anyone who does alleviate suffering is completely against god ? 7. How can anyone then heal god's punishment ? From what God? From unknown God that created us and loose interest to us? Evidence shows he HAS lost interest! Exact;y what was done re old testament - to fit the idea god is the worst punisher of EVERYONE ! And who will not judge you for your deeds and not require from you a change in positive direction? What positive direction, stop pushing middle eastern religion of a silent god on a Science site ! Is that the very BEST way a real god communicates ? Currently you going through spiritual catharsis. It is normal when one person is confronted with the truth and it is so much different with his illusions crumble like sand towers. But this will go and when you accept the truth will be easier for you without internal contradictions and will begin to live fully without lies. "Currently you going through spiritual catharsis. It is normal when one person is confronted with the truth and it is so much different with his illusions crumble like sand towers." Oops, sorry. Accidentally gave you a 1 instead of 5. (Smacks own hand.) Apologies. The picture at the top makes it appear that great heat is required. In this context, Stanley Miller showed that adenine and similar molecules formed when ammonium cyanide was immersed in liquid nitrogen for something liken 3 decades. Now, that is a patient experiment! Read the following in depth interview with Francis Collins and let us know if "the dark ruler " has blinded his eyes..
No response from you will once again prove your cowardice. The theory of biological evolution is wrong from "a" to "z". You are not able to designate at least one of its claims that can withstand true scientific verification. What is uncomfortable about the 10 commandments is that the first 3 require a belief in Jehovah or the other 7 won't work. Bigotry of this sort makes me very uncomfortable. But what eases my consternation is the fact that there were never 2M Hebrews in goshen who never wandered through Palestine for 40 years and were never led by a guy named Moses who never received those tablets on a mountain which doesn't exist. Evidence tells us these things. Xians all tailor their personal god to suit. But you settle for the comfort of a supreme protector because you can't face reality. Youve been shown the evidence time and again. Not my fault if you don't have the courage to accept it. The bible says there was a flood. There was no flood. What makes you think you're so damn interesting that the creator of the universe would want you hanging around forever? Oh I remember - you read it in his book, the one where we find an OT purportedly written by Moses. But close examination reveals that the torah had no fewer than 5 authors. Most of your religious scholars accept this uncomfortable fact. Or how about the NT? Upwards of 40% of the works ascribed to Paul are forgeries. And who added the last 11 verses to Mark decades after it was written? Who added the 'cast the first stone' parable a century later? Did god have afterthoughts? No, the uncomfortable truth is that people promise other people immortality, wish-granting, absolution, and retribution for their own selfish reasons; not gods. And certainly not gods who write books full of such glaring errors and adulterations. Failure to address any of my specific questions & your claim shows you up, you are suffering crisis of confidence ! ONLY claim about your god is from a very OLD book - that's all ! OT was written by men, David even admits "god spoke in a dream", do you imagine dreams are reliable means of finding anything - especially getting communication from a claimed god, one that can't distribute works of education to ALL his creations at the SAME time so no prophet can be selective ? 1.How does it communicate ? 2.How does it care ? 3.Why does OT show your god acts EXACTLY like a Devil ? 4.How can you check your god is NOT any sort of Devil ? 5.Why not follow Mohammed's claim instead of OT ? OT has immense contradictions & SHOWS god is NASTY or it lies badly ! Yikes, that puts viko_mx in a very pathetic state indeed. The hypnosis patterns by relying on the 'E-meter' are a way to get past certain psychological defenses and engage a cross-over of operant & classical conditioning so the intellect is effectively subdued. Known that in earth's early high ammonia atmosphere, formamide can be created easily through simple chemistry, give it just a little time & heat & it forms guanine - which is a DNA base, it seems there is also evidence all other DNA bases can form similarly but take a little longer & not much even in just hours & helped along by immense physical dynamics, injection of charge & especially lightning etc. I also read some years ago that cyclical freezing/cooling can produce the necessary cyanide complexes which can then react with amino acids but it only takes a few weeks or so. Self assembly seems built in universally ! ''...created nucleic acid precursors starting with just hydrogen cyanide (HCN), hydrogen sulfide (H2S), and ultraviolet (UV) light." "Let there be light" is missing from Nicholas Wade's report on this research. Without the anti-entropic epigenetic effect of light, and the light-induced de novo creation of amino acids, there would be no amino acid substitutions. The nutrient-dependent substitutions differentiate all cell types in all genera via their physiology of reproduction. Viruses perturb the biophysically constrained chemistry of RNA-mediated cell type differentiation and reproduction. They link entropic elasticity to ecological adaptations and biodiversity, but only via the anti-entropic effects of light. I am a caring God, I only want the best for you. Therefore, your children shall be afflicted with Cerebral Palsy.